I’ve saved the best for last. This is one of my most cherished recipes, and I make it over and over again for my kids and friends. I had this for the first time at Tre Vigne in St. Helena when I was 24 years old and on my first trip to the Napa Valley. Michael Chiarello, now a very famous chef, vintner, TV host and sustainable farmer with his own restaurant, Bottega in Yountville, was the chef. I still love this restaurant and had lunch there on my birthday this year (December, 2015). Back then this entrée cost only $8, and we had lunch on the beautiful Tra Vigne patio. I was with my sister, Sandra Sheehan and my Auntie Deborah. It was a hot summer day and there is nowhere on earth more pleasant than the Napa Valley in the heart of the wine country in the summer. What bliss. I returned many times and I always ordered this dish until it was taken off the menu a few years ago, but I highly recommend the Maltagliati Verde (herb infused pasta with slow cooked lamb) which we had on my last visit. 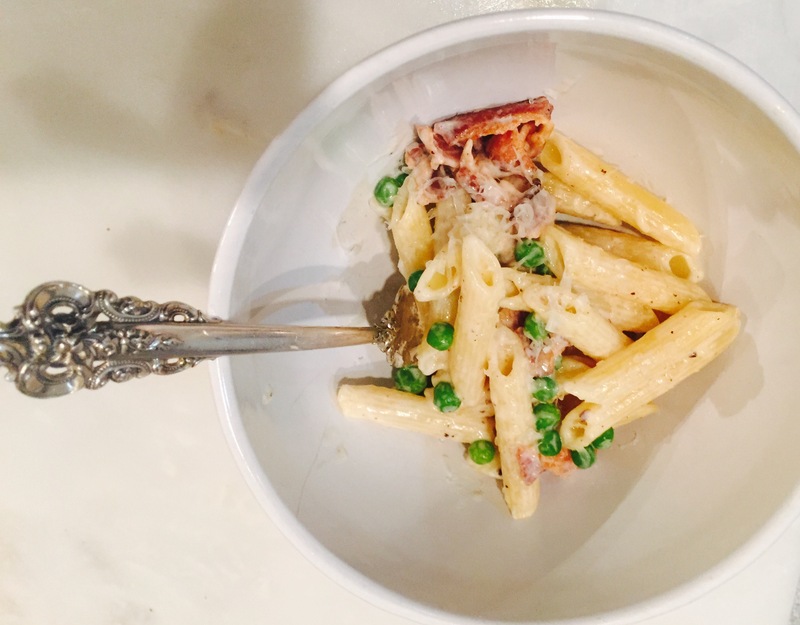 After the kids were born, I couldn’t make it to Tra Vigne as often, so I taught myself how to make Michael’s recipe at home, and my kids love it too. It’s perfect in a pinch when you find yourself with 12 unexpected and very hungry kids for dinner (double the recipe below), add a salad and some crunchy bread. As for Michael Chiarello, he can still be found at the stove and was gracious enough to join us (on the patio of course) one afternoon at his restaurant Bottega for lunch. He will forever remain one of my favorite chefs and inspirations. Boil the pasta, as per the package directions, and then begin making the sauce. Heat a large sauce pan or dutch oven to medium heat. Once hot, add the olive oil, then the chopped prosciutto and garlic. Brown lightly. When the pasta is done, drain and add it to the ham and garlic mixture. Then, add the butter and cream and reduce heat to low. Stir gently until the ingredients are well combined. Add the cream, fresh grated parmesan cheese, stir well and reduce for 5 minutes. Serve immediately in a warm bowls with freshly grated Parmesan. Love the blog. That was a wonderful day 24 years ago. I remember the pasta. Great memory, inspiring delicious recipe that can be made with ease, that makes me want to whop some up for dinner tonight. I love your writing, you are so gifted and talented, and I love that you want to write.